This is undoubtedly Bendis’ toughest gig. He got rid of one of our dearest characters and introduced someone we don’t know well enough to care about yet and must press on with a new WWII themed storyline. We are really hurting but we must remember to have faith. We have never been let down yet so there is no reason to doubt the master plan. It is hard and just as we are aching so too are the characters we love. Just as we think one loss is too much our other lead is really put through the wringer. Can things get any worse? As readers we are in a low place, there is a solid and interesting storyline but are we grieving too much to let it engage us? What doesn’t seem to work are the out of place pop culture digs, poor jokes and extra gore. It seems Bendis doubts himself and needs to keep us around till the payoff using cheap tricks. But there is indeed a payoff. That final page blows us away and makes everything rosy in the Powers universe once more. The biggest surprise here is the art. I had to check it was still Oeming but apparently it is. Either he has broken his wrist or his lower paid evil twin/ dark apprentice has taken over. It doesn’t seem to have the polish of his earlier volumes. There is no breath-taking colour, no innovative technique and the whole thing seems blocky and murky. This was a noticeable disappointment. If this is the first Powers you read then you would find it a solid and interesting story. If you have been with it from the beginning you will find it a rocky road but with an incredible payoff. 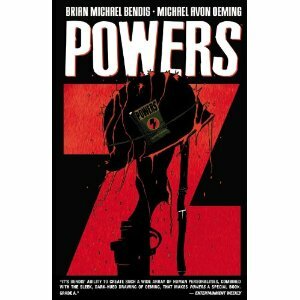 The next volume will certainly be the most eagerly anticipated in Powers history as you can’t wait to see what Bendis will do next. A Thumbs Up. Did you know that the new Powers trade is now out? According to Amazon and The Book Depository it comes out on October 24th. I was hoping to wait for volume 14 before I tackled Powers but things didn’t work out that way and I had to rush it in earlier than planned. Thanks for taking the trouble to let me know though. The owner of my comic shop gave it to me today. He said it turned up last week without appearing on his shipping list. Enjoyed your Powers reviews. IMO Forever and Cosmic are the best stories, though I must admit I am wearying of the series a bit. Still to read the new book though, so we shall see!